Judith Goolsby’s visionary art bridges the gap between primitive, storybook paintings, and museum quality folk art. Judi has a very strong sense of color. She just sees the world differently! 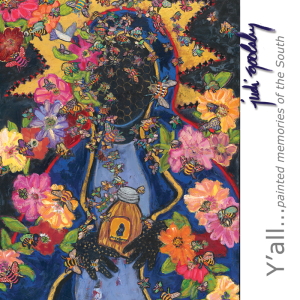 Judi Goolsby is an acknowledged artist and master of her own primitively refined form of painting. It is both contemplative and dramatic, abstract but with allusions to imagery and text. It is exciting to the senses and yet personal. The nuanced push-pull, back and forth between layers, creates dynamic tensions that infuse her work with sophisticated innocence, beauty, humor and an authenticity that the artist confidently owns. 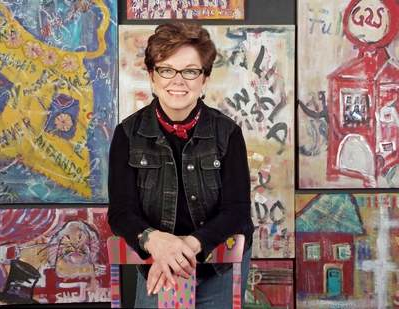 Goolsby is a painter of stories…her stories. Artist Judith Goolsby’s art will be hanging at Olio’s in Mancos through Feb. 23. American artist Judith Goolsby was born in Louisville, Ky. in 1943 and spent her childhood under the spell of the South. She is best known for her narrative paintings with layers of color and text created from visual marks, fabric or thread, embedded in paint. Her images are primitive and naive. Poetic humor in her art reflects her view of the world. Goolsby’s art can be seen at Olio’s, 114 W. Grand Ave. in Mancos. The exhibit will hang from Jan. 5 through Feb. 23. “Judith’s sense of color is so strong and she obviously sees the world differently than others do,” said fellow Artist, Kim English. Today, much of Goolsby’s work is reflective, with roots in the stories, colors, and images of her past and her early childhood without her father who died in the war. Goolsby was born artistic and continues to draw upon her ability to create “storybook paintings”. Her talent to paint color on canvases, layer upon layer, until each story is complete, gives her overall body of work a magical quality. From hand painted tiles, old photographs, vintage fabric, and stitched paintings, her studio is a place for discovery. The private studio of Goolsby is a short drive north of the Santa Fe Plaza in Tesuque. Visitors are always welcome. Please telephone 505-986-5073 or contact her by e-mail at judigoolsby@comcast.net.